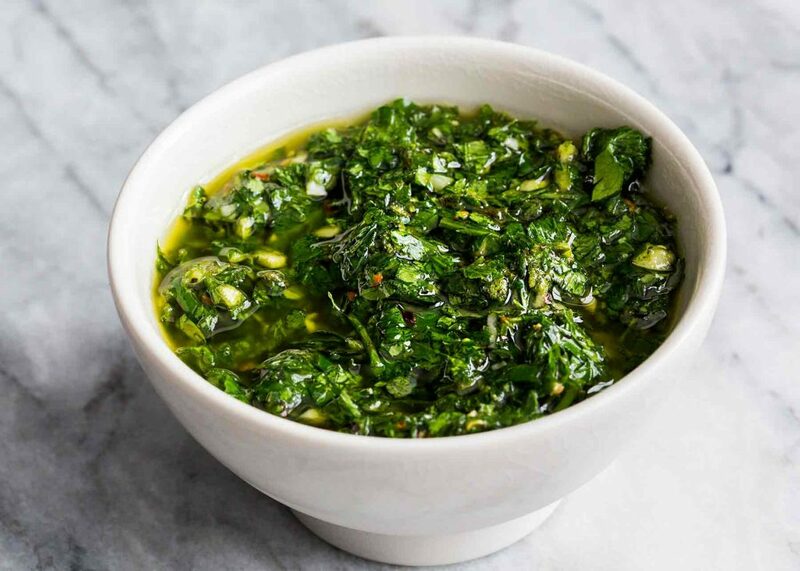 Chimichurri or chimmichurri is an uncooked sauce used for grilled meat; it comes in a green version (chimichurri verde) and a red version (chimichurri rojo) and seems to come from Argentinian cuisine. It is made of finely chopped parsley, minced garlic, vegetable oil, oregano, and white vinegar. In Uruguay, the dominant flavoring is parsley, garlic, red pepper flakes, and fresh oregano. Provoleta is a trademark for an Argentine variant of provolone cheese described as “Argentine pulled-curd Provolone cheese.” It is eaten barbecued in Argentina and less commonly in Uruguay. The cheese was developed by Natalio Alba in about 1940, and the PROVOLETA trademark was established in 1963. 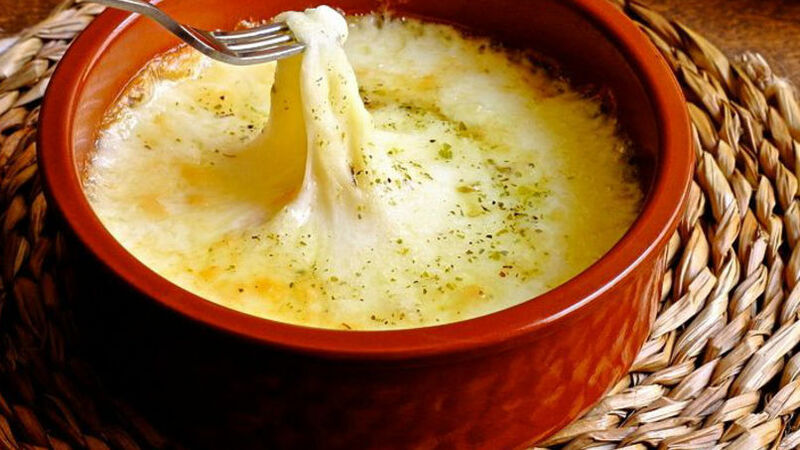 The cheese is produced with a pulled-curd (pasta filata) technique is used. Small discs of locally produced provolone cheese of 10 to 15 cm in diameter and 1 to 2 cm in height are often eaten at the start of an asado, before the grilled meat. The provolone, often topped with chilli and oregano, is placed directly on the grill, on small stones or inside a foil plate, and cooked until part-melted. The provoleta may be seasoned with chimichurri, a mixture of oils and spices, and is usually eaten communally with bread. Mate, also known as erva mate and chimarrão or yerba mate and cimarrón is a traditional South American caffeine-rich infused drink, particularly in Argentina and Uruguay (where it is defined by law as the “national infusion”), Paraguay, the Bolivian Chaco, Southern Chile and Southern Brazil. It is also consumed in Syria, the largest importer in the world, and in Lebanon. 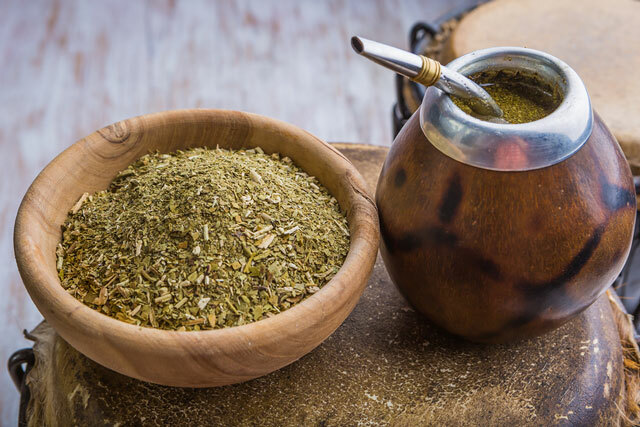 It is prepared by steeping dried leaves of yerba mate (Ilex paraguariensis, known in Portuguese as erva-mate) in hot water and is served with a metal straw from a shared hollow calabash gourd. 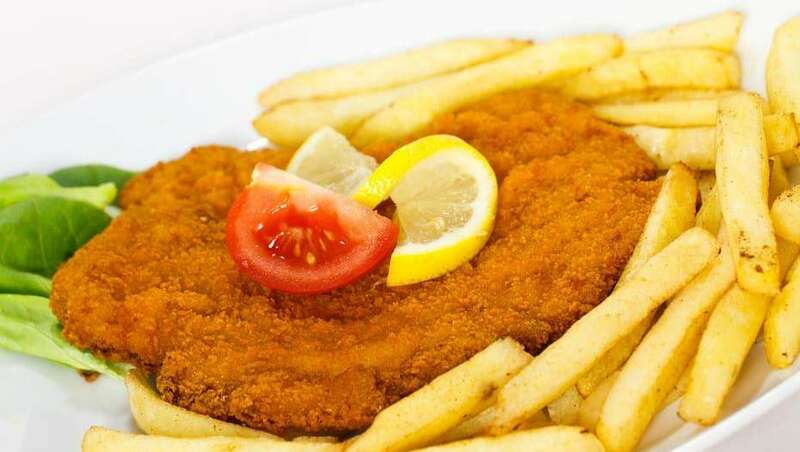 The milanesa is a South American variation of an Italian dish where generic types of breaded meat fillet preparations are known as a milanesa. A milanesa consists of a thin slice of beef, chicken, veal, or sometimes pork, eggplants, tempeh or soy. Each slice is dipped into beaten eggs, seasoned with salt, and other condiments according to the cook’s taste (like parsley and garlic). Each slice is then dipped in bread crumbs (or occasionally flour) and shallow-fried in oil, one at a time. Some people prefer to use very little oil and then bake them in the oven as a healthier alternative. A similar dish is the chicken parmigiana. Matambre is the name of a very thin cut of beef in Argentina and Uruguay, taken from between the skin and the ribs, a sort of flank steak. 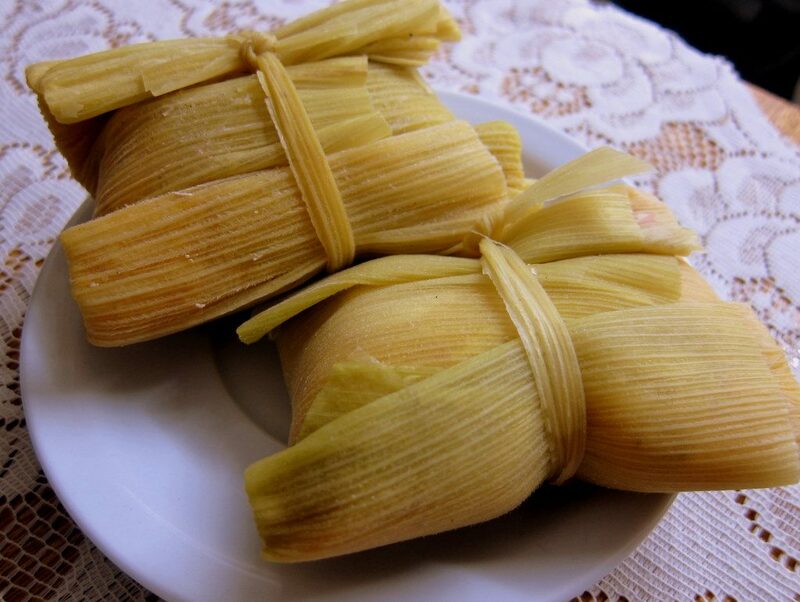 Humita is a Native American dish from pre-Hispanic times, and a traditional food in Argentina, Bolivia, Chile, Ecuador and Peru, although their origin is unclear. In Argentina, Chile, Ecuador and Peru they are known as humitas, in Bolivia as humintas, in Brazil as pamonha, and in Venezuela as hallaquitas. It consists of masa harina and corn, slowly steamed or boiled in a pot of water. In Argentina, humitas are prepared with fresh corn, sautéed onions and some spices, depending on the region or taste. The dough is wrapped in corn husks and boiled. It is also common to add some diced cheese to the dough, typically queso fresco or goat cheese. Choripán is a type of sanguche with chorizo popular in Argentina, Uruguay, Chile and southern Brazil. The name comes from the combination of the names of its ingredients: a grilled chorizo (sausage) and a pan (crusty bread) such as a marraqueta or baguette. 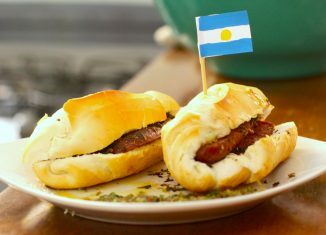 The Argentine choripán consists of a sausage made out of beef and pork, hot off the grill, split down the middle, and served on a roll. The chorizo may be used whole or cut in half lengthwise, in which case it is called a mariposa (butterfly). It is customary to add sauces on the bread, most likely chimichurri. 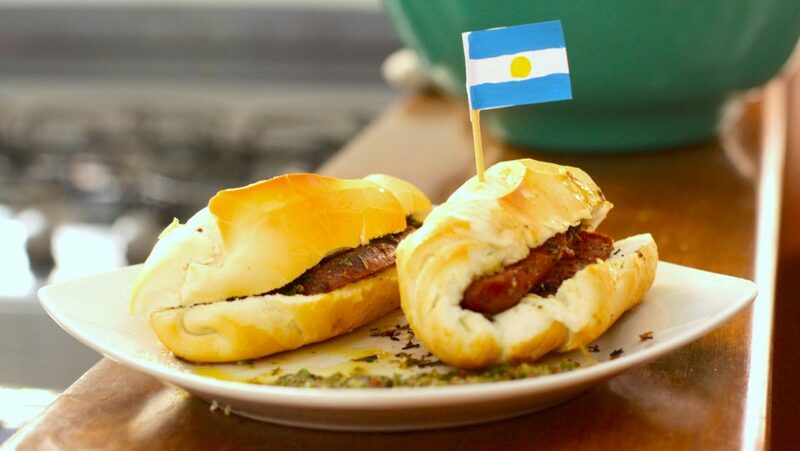 Choripanes are commonly served as an appetizer during the preparation of an asado, but they are also very commonly sold at sport venues (particularly footballgames) and on the sides of roads and streets in major cities in Argentina. Taxi cab drivers in Buenos Aires are avid consumers and some street sellers can gather a long line of cabs during lunch time and afternoons when drivers get their lunch break. 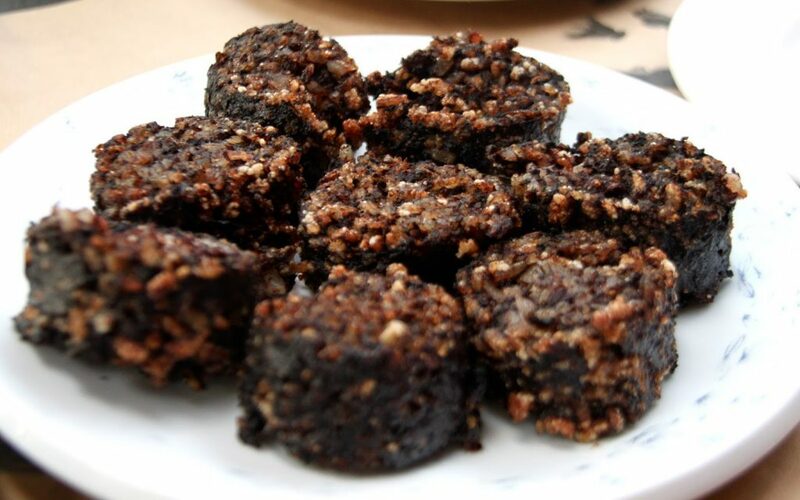 Blood sausages are sausages filled with blood that are cooked or dried and mixed with a filler until they are thick enough to solidify when cooled. Variants are found worldwide. Pig, cattle, sheep, duck, and goat blood can be used, varying by country. In Europe and the Americas, typical fillers include meat, fat, suet, bread, cornmeal, onion, chestnuts, barley, and oatmeal. In Spain, Portugal, and Asia, northern-climate cereals are often replaced by rice. Croissant is a buttery, flaky, viennoiserie pastry named for its well-known crescent shape. Croissants and other viennoiserie are made of a layered yeast-leavened dough. The dough is layered with butter, rolled and folded several times in succession, then rolled into a sheet, in a technique called laminating. The process results in a layered, flaky texture, similar to a puff pastry. 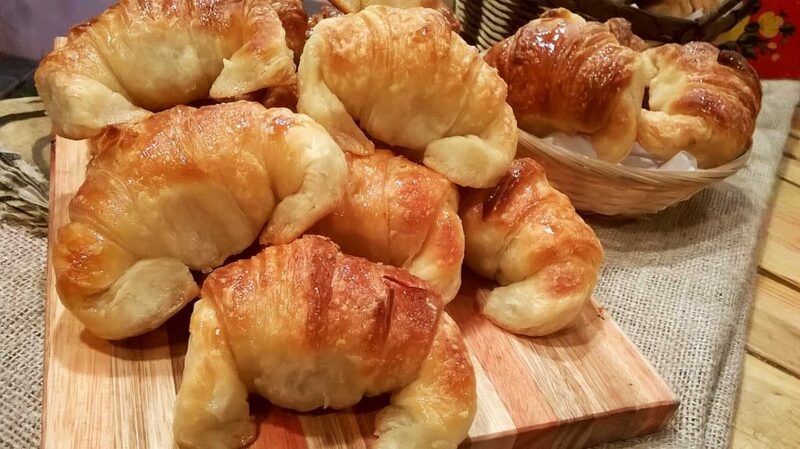 In Argentina roissants are commonly served alongside coffee as a breakfast or merienda. These are referred to as medialunas (‘half moons’) because of their famous shape and are typically coated with a sweet glaze (“de manteca”, made with butter). Another variant is a medialuna de grasa (“of lard”), which is not always sweet. Standard Argentine pizza has a thicker crust than traditional Italian style pizza and includes more cheese. Pizza is made with very thin, and sometimes thick, high-rising doughs, with or without cheese, cooked in the oven or a la piedra (on a stone oven), and stuffed with numerous ingredients -— is a dish which can be found in nearly every corner of the country. Buenos Aires, Rosario, and Córdoba also serve it with fainá, which is a chick pea-flour dough placed over the piece of pizza. People say that what makes the Argentine pizza unique is the blending of Italian and Spanish cultures. At the turn of the 19th century, immigrants from Naples and Genoa opened the first pizza bars, though Spanish residents subsequently owned most of the pizza businesses. 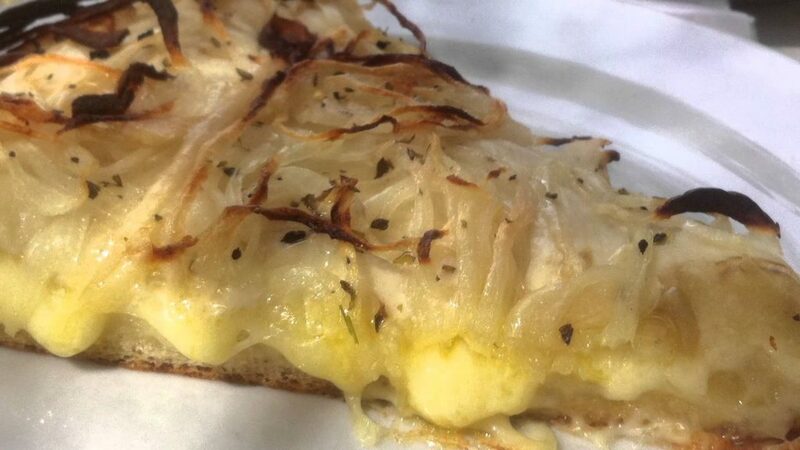 Another very popular kind is the fugazza, which consists in a regular pizza crust topped with onions, ground black pepper, olive oil and mozzarella cheese (in this case it is called fugazzeta). 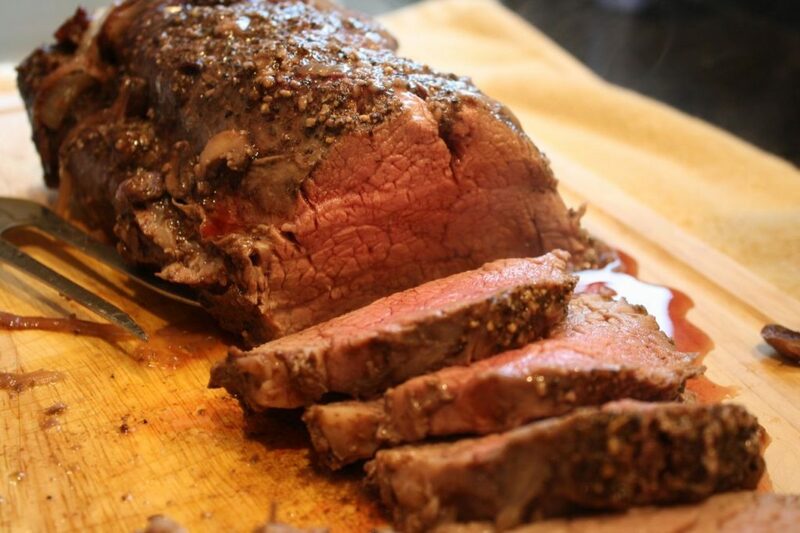 Beef is a key component of traditional Argentine cuisine. rgentina has the world’s second-highest consumption rate of beef, with yearly consumption at 55 kg per person. In 2006, livestock farmers kept between 50 and 55 million head of cattle, mostly in the fertile pastures of the Pampas. The country is currently the third-largest beef exporter in the world after Brazil and Australia. The national government applies a 15% tax on beef exports and has applied further restrictions since March 2006 to keep domestic prices low. Beef is traditionally cooked over charcoal flame (as an asado) and served often as part of a wider selection of grilled meat, with chimichurri as a relish. Asado is used in the same way as the English word “barbecue”, both for a range of barbecuetechniques and the social event of having or attending a barbecue[ in Argentina, Chile, Paraguay and Uruguay, where it is very popular. In these countries, asado is a traditional way of preparing food and a traditional event. An asado usually consists of beef, sausages, and sometimes other meats, which are cooked on a grill, called a parrilla, or an open fire. 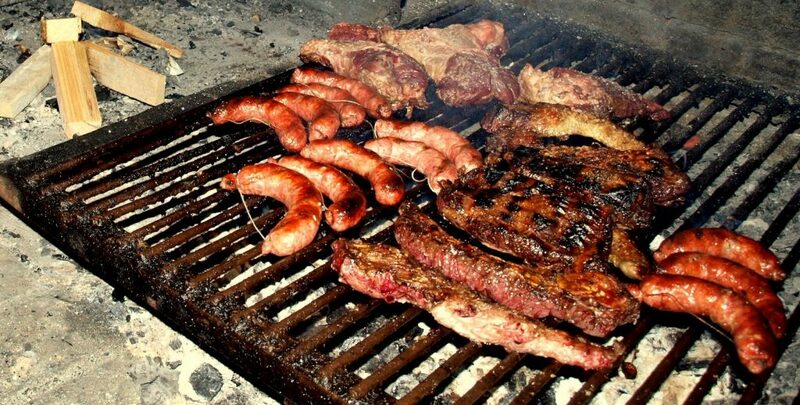 An asado almost always includes meats, and usually embutidos (sausages, etc.) and offal. Generally in more elaborate versions the embutidos and meats are accompanied by red wine and salads. In more formal events and restaurants, food is prepared by a person who is the assigned asadoror parrillero. In informal and relaxed settings, this is customarily done in a collective manner by volunteers. An alfajor or alajú is a traditional confection found in Uruguay, Chile, Argentina, Peru, Spain, Paraguay, Venezuela and Southern Brazil. 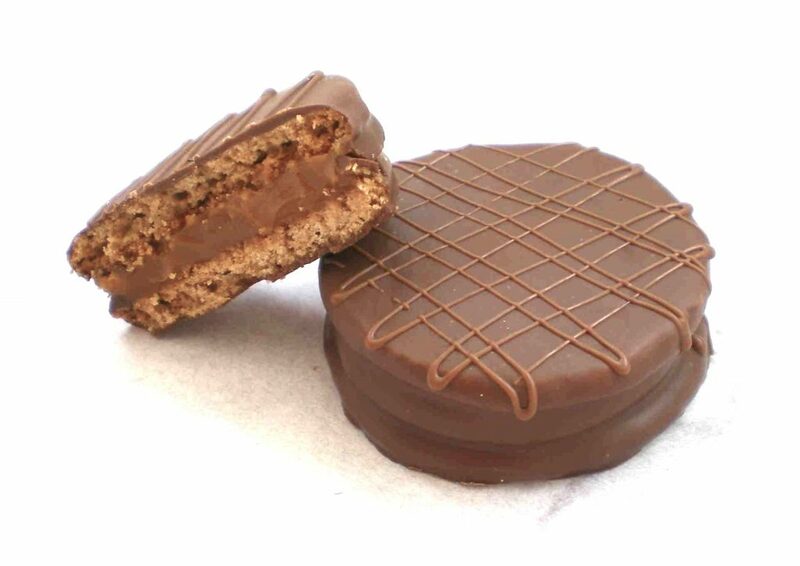 The archetypal alfajor entered Iberia during the period of al-Andalus. It is produced in the form of a small cylinder and is sold either individually or in boxes containing several pieces. Locro (from the Quechua ruqru) is a hearty thick stew popular along the Andes mountain range. It’s one of the national dishes of Argentina, Bolivia, Peru and Ecuador. The dish is a classic corn, beans, and potato or pumpkin soup well known along the South American Andes. 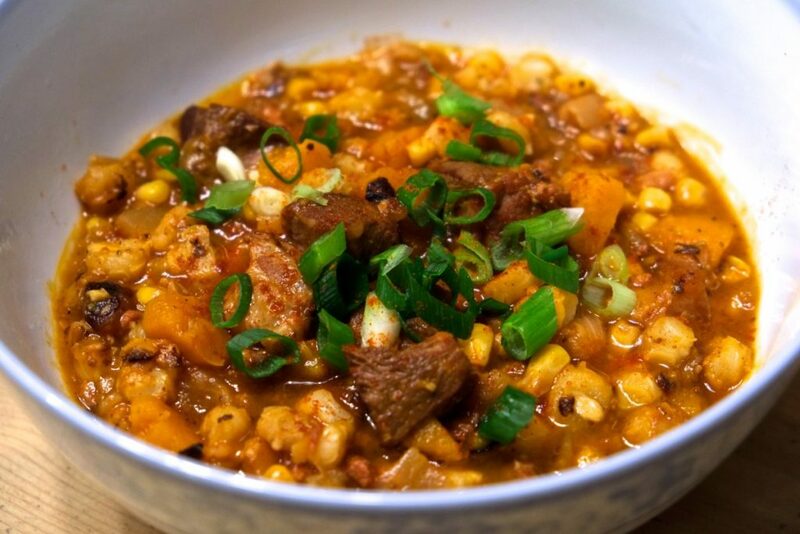 Typically locro is made using a specific kind of potato called “papa chola”, which has a unique taste and is difficult to find outside of its home region. In Argentina it spread from the back to the front Cuyo region to the rest of the country. 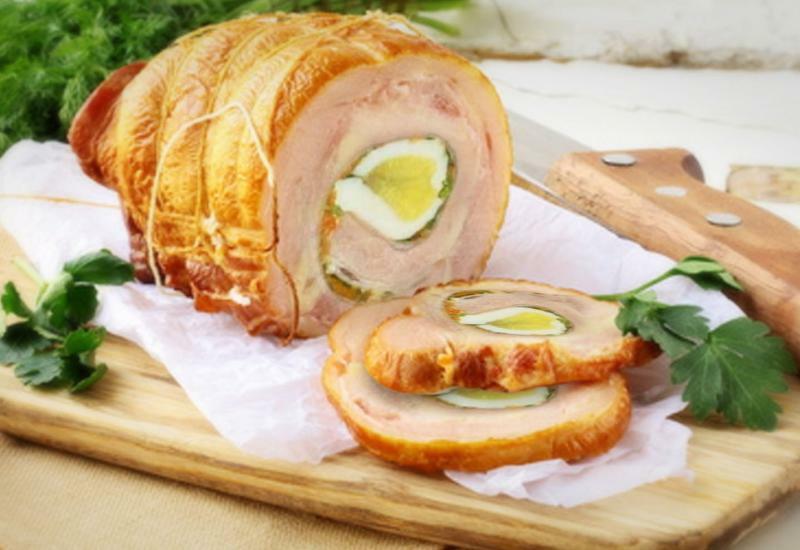 It is considered a national dish and is often served on May 25, the anniversary of the May Revolution. A red hot sauce made from red peppers and paprika known as chimichurri is served sometimes on the side. An empanada is a stuffed bread or pastry baked or fried in many countries of Latin America and in Spain. The name comes from the Spanish verb empanar, meaning to wrap or coat in bread. Empanadas are made by folding dough over a stuffing, which may consist of meat, cheese, huitlacoche, or other ingredients. 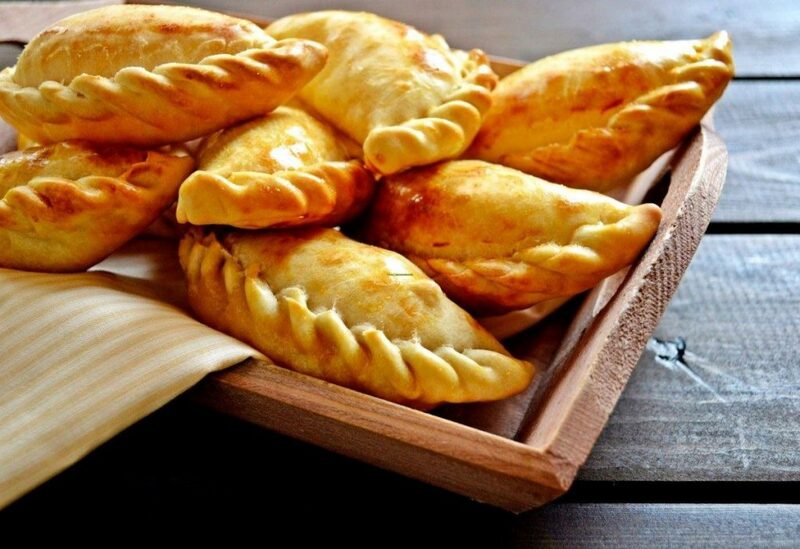 Argentine empanadas are often served during parties and festivals as a starter or main course. Shops specialize in freshly made empanadas, with many flavors and fillings. The dough is made with wheat flour and beef drippings for the fillings which differs from province to province. Some places use chicken, and some places beef (cubed or ground depending on the region) spiced with cumin and paprika. Some other fillings are onion, boiled egg, olives, or raisins. Empanadas can be baked or fried. It also can contain ham, fish, humita (sweetcorn with white sauce), or spinach; a fruit filling is used to create a dessertempanada. For the interior regions, they can be spiced with peppers. 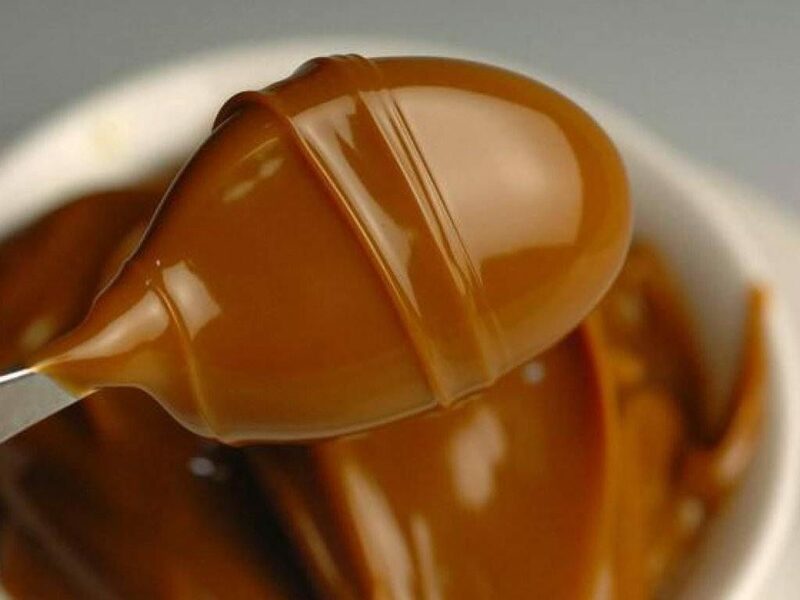 Dulce de leche is a confection prepared by slowly heating sweetened milkto create a substance that derives its flavour from the Maillard reaction, also changing colour, with an appearance and flavour similar to caramel. Literally translated, it means “candy [made] of milk” or “sweet [made] of milk.” Its origin is a highly debated topic and it is popular in most Latin American countries.